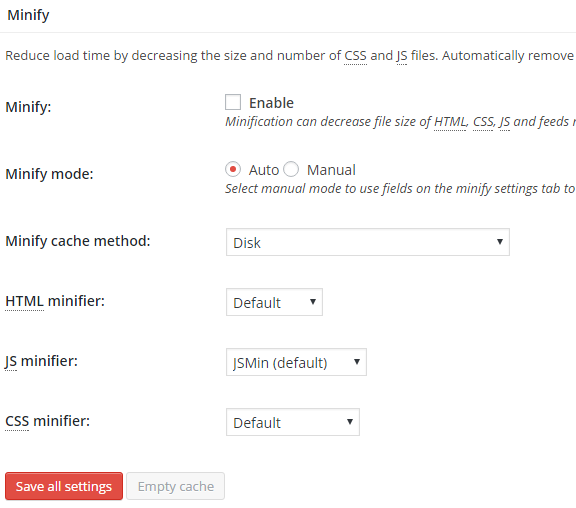 Learn how to configure W3 Total Cache WordPress Plugin for best performance. With the changing time, website speed and loading time have become a more important factor for better user experience as well as for search engine ranking. WordPress Cache plugin plays an important role to make your site snappy fast by caching various files and objects of your site. 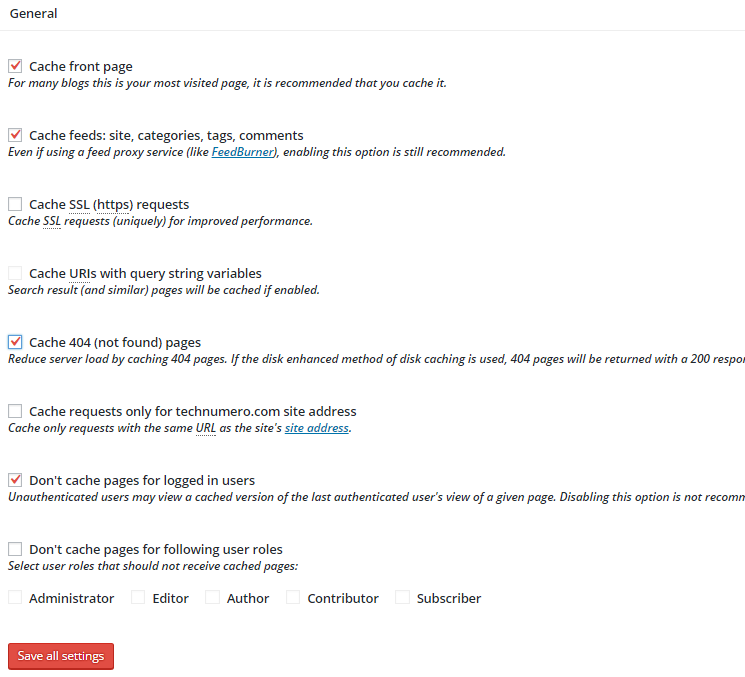 There are many cache plugins available for WordPress, but as you know not all of them are equally good. W3 Total Cache is certainly one of best and most recommended plugin out there. In this guide, I will take you through – how to install W3 Total Cache plugin and how to configure W3 Total Cache WordPress plugin for best performance. You can install W3 Total Cache by searching it in plugin directory under WordPress dashboard > Plugins> Add New. I am sure that most of you already know how to install a plugin in WordPress. But who are new to WordPress can refer this beginners’ guide How to install WordPress Plugins by three different methods. You can install and activate W3Total Cache plugin using this guide. Once you installed this plugin then comes the real task i.e. configuring it for most optimized performance. So let’s start, how you can setup W3 Total Cache WordPress plugin for better performance of your WordPress site. You can navigate to W3 Total Cache settings by clicking Performance button on the left sidebar in the dashboard of your WordPress. I am sharing the settings which are used on this site and on our other sites, and we noticed a huge improvement in page loading time and number of requests by using this plugin. 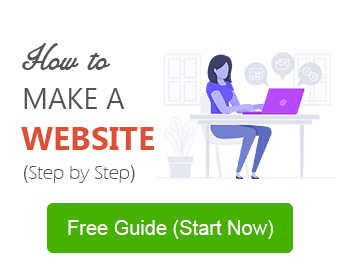 But before applying these setting, I suggest you get a baseline data of your website’s page load time and the number of requests through Pingdom or GTmatrix. It will help you to compare details before and after setting up the plugin and will give you the complete picture. On one of our testing site, we used this plugin and tested loading time and number of request on Pingdom. We got 50% reduction in no. of requests (20 requests to 10 requests) and it took only 1.57 sec to load, loading time before using the plugin was 3.44 sec, difference of about 2.0 sec which is huge. So we tested it again on GTmetrix with the plugin and without the plugin and guess what? Page loading time and the number of requests increase by 50%. So, the long story short, if you want to give wings to your website, use the recommended settings given below and launch it like a rocket. Let’s start to configure W3 Total Cache WordPress plugin for best performance WordPress site. General settings are an overview of all settings of W3 Total Cache plugin. From General settings, you can setup broader level settings of the plugin. I will share broader level setup as well as individual setting tuning so that you can have a clear idea of setting up W3 Total Cache of better results. The first option under general settings is Page Cache. 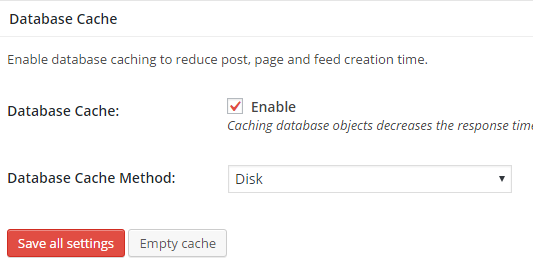 Enable Page Cache with Disk: Enhanced method. As this method is highly recommended for people who are using shared hosting. Check Enable box and click Save all settings. Minify is an important option. Prefer to leave it unchecked under general settings. As we will set up Minify under individual settings option. Enable Database Cache by checking the box. Choose Disk method for database caching. Enable Object Cache with Disk method. Browser Cache should be enabled by default, if not enable it by checking the box. Leave other settings on the General Settings page as default, and make sure that you click Save all setting to save changes. Import / Export Settings can be utilized to export the current settings of the plugin and then to import those settings on the same site or on another site. Make sure that you have checked following options (which we have shown in the screenshot below), and leave rest settings as default. Save changes by clicking Save all settings. Leave the rest settings as default. Save changes by clicking Save all settings. Note: Minifying HTML, CSS and JS drastically reduce the page size which is very good and important but in some cases (say 2 in 100), minifying HTML/JS broke your page design. In that case, you should disable all the minify settings from W3 Total Plugin, save the setting and Empty all caches. You can find an alternate method to minify HTML, CSS and JS here. 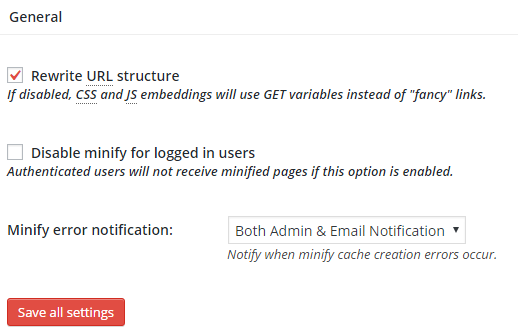 ‘Disable cache queries for logged in users‘ comes enabled by default, if not enable the following option for desired behavior of WordPress. It must be enabled, leave the rest and hit the save button. Skip the object cache as default settings are already optimized. Browser Cache is important. You should apply Browser Cache options carefully as per the given below screenshots. And don’t forget to hit the Save all settings button. Do you know, Browser Cache can also be enabled without using a plugin? Read Leverage Browser Caching without plugin in WordPress to know more. Bonus: If you are using the WordPress SEO by Yoast, go the Extensions Tab and Activate the Yoast extension, it will help both the plugins to integrate in a best possible manner. Yep, that’s it. Congratulations! You have successfully configured W3 Total Cache WordPress plugin for your website. Open your website in another browser and load it 2-3 times, so that plugin start transferring cached content. Now it’s time to compare the number of requests, page loading time and page size with your baseline data. You will certainly notice huge improvement in your website. I hope this guide help you to configure W3 Total Cache WordPress plugin for best performance. This plugin has a lot of settings and all the settings are in huge details. I tried to cover all necessary setting which are useful for making your WordPress site really fast. If have any question regarding how to configure W3 Total Cache WordPress plugin, feel free to write in comment section below. I will be happy to help. You saved my day with this tutorial buddy. thanks. Any time i use this plugin my website breaks, but after disabling the minify setting, its perfectly working now. W3 Total Cache is a very helpful plugin. Indeed its a good plugin. But that’s all you want to say. Hope you haven’t commented merely mentioning your site URL. Excellent. I was facing slow speed issue on one of my blogs. W3TC is my favorite tool for optimization, from the very beginning. I love the plugin as it does a tremendous job to speed up the website. This tutorial will help us to become advanced user & unlock the hidden benefits of W3TC. Thanks for sharing details with screen-captures. A very nice guide. Earlier on I only removed the query strings but still, there was tremendous reduction in loading time. It has now reduced further to 1.6s. After installing the plug-in and setting everything the way you describe above, my web score remains the same (PageSpeed and GTMetrix both at 89). Also, in GTMetrix, I can see that the score has not increased and the ‘critical’ topics still remain. In your opinion, do you think I am doing something wrong or that it is what it is? That’s really surprising because it helped to improve site performance for so many other readers. Share some more detail so that we can have a look what’s going on. Looking forward to listening more from you.